Quiet and isolated, Amboli is a perfect hill station for those who really want to get away from the hustle and bustle of city life. Situated at an altitude of 690 m, Amboli lies in the Sindhudurg district of South Maharashtra. Also known as the Cherrapunji of Maharashtra, Amboli is the last mountain resort before the coastal plains begin. On one side of Amboli lies the Konkan coast, the other three flanked by handsome looking valleys. Since it lies in the Sahayadri Hills one of the world's Eco Hot-Spots, Amboli boasts variety of flora and fauna. Like any hill station, Amboli offers many attractive walks and several waterfalls. 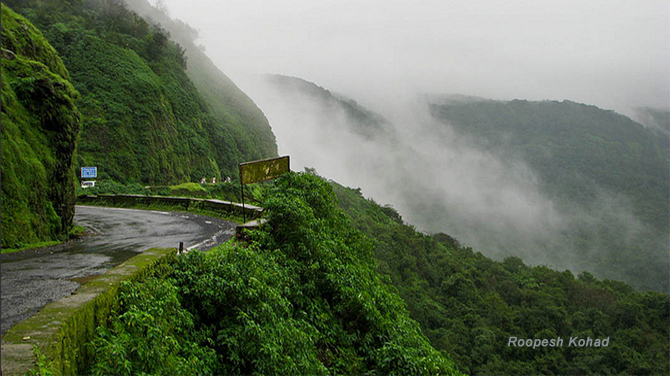 Amboli also receives an annual rainfall of nearly 750 centimeters making it the wettest place in Maharashtra. Amboli is blessed with thick forest due to such a heavy rainfall. Best time to visit Amboli is during winter when the hills are covered by mist and it looks beautiful. Sunset Point, the highest point at Amboli, Parikshit Point, Kavelsad Point and Shrigaonkar Point offers a panoramic view of the surrounding forests. The Sea View point offers a panoramic view of a good part of konkan coast. The bauxite mines can also be visited. The Amboli Ghat on sawantwadi road, The historical Botanical Garden, Hiranya Keshi, Nangartas Waterfall etc are the other few major attractions at Amboli. Originated from the mouth of a cave near Hiranyakeshi (Hiranyakeshi is goddesses Parvati) Temple, a shrine dedicated to Lord Shiva, Hiranya Keshi river site is famous for its amazing natural beauty. It is situated 6 km from the town center. It is also an ideal place for fishing and meditation. Hiranyakeshi ugam, the starting point of the river Hiranya Keshi can be accessed through a tiny rocky path. Situated 10 km from Amboli, it has pleasant surroundings. It falls deep and noisy into a beautiful and narrow ravine. A concrete bridge has been constructed over it so that tourists can enjoy its beauty. Best to see this waterfall during monsoons. Around 5 km from here is another waterfall known as 'waterfall' by the locals. Situated on the Amboli ghat road, the sunset point offers a spectacular view of sunrise and sunset scenes. Madhavgadh Fort, four times the size of Shanivarwada (a palace fort in Pune) which is now in a state of ruin. A memorial on the main road gives an insight into the 'war' and the tombstone reads that there was only one British soldier who died in the battle.